Featured here are medium voltage feeder cables at a wind farm substation in South Dakota. These cables are the site’s most critical link, handling the output of 10 to 20 turbines. IMCORP Factory Grade® technology found that all of the cable terminations were not IEEE 48 compliant. The site operator initially placed the blame on the manufacturer, but this proved to be unlikely, as cold shrink terminations from multiple manufacturers were used. Unconvinced, the site operator insisted on replacing the terminations with heat shrink terminations after the initial repair of the cold shrink terminations did not remedy the problem. When the new terminations failed to fix the problem, the cables were inspected more thoroughly. This examination found that the cable was slightly 'out of round'. As a result of the cable being out of round, every time the terminations were replaced in an effort to fix the cable, the cable was actually damaged further. Cable tools and repair processes are designed to work on a cable that is perfectly round. If an out of round cable's outer insulation shield is stripped, the round radial cut pattern of the stripping tool will gouge the Tree Retardant XLPe material under the insulation shield leading to PD activity. 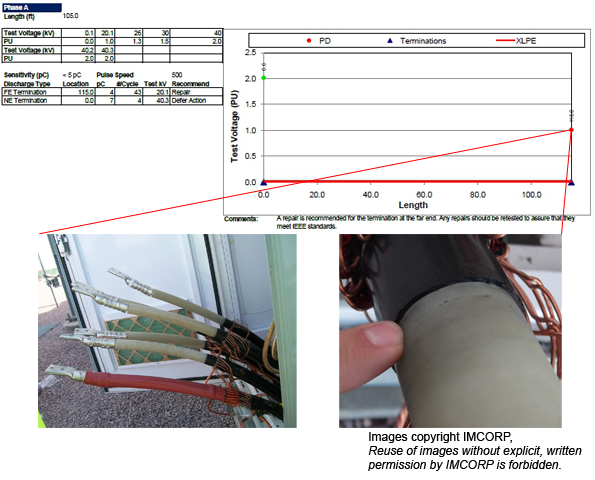 Subsequently, the insulation cutback was redone and the feeder cables then passed the IMCORP Factory Grade® assessment.